Millions of Americans will be hitting the road this Thanksgiving and they will be doing it with family in tow. AAA predicts that 43.5 million Americans will be traveling this year and that means that safety is a top priority when driving to your Thanksgiving feast. Despite parents’ best efforts, reports indicate that 75 percent of car seats are not used correctly, which is why Buckle Up for Life and Toyota have released tips on how to keep youngsters safe on the road this holiday season. "The holidays are a reminder to be thankful for all that we have – and for so many of us this includes the children in our lives," said Gloria Del Castillo, child passenger safety expert at Cincinnati Children's and senior outreach specialist for Buckle Up for Life. "We want every parent and caregiver to have the knowledge and resources they need to help keep child passengers safe during this special time of year and beyond. These tips from Buckle Up for Life may seem simple, but they could save a child's life in the event of a crash." Buckle your child in and then pinch the car seat strap near the child’s shoulders. If you can pinch a wrinkle in the fabric, you should tighten the strap until it is snug. Next, grab the car seat at the bottom where it is attached to the car. Tug the seat from side to side, then front to back. If the seat moves more than an inch in either direction, it needs to be tightened. Make sure that everything you are traveling with in the car is secure and won’t become a projectile in the case of sudden moves or in the event of a crash. 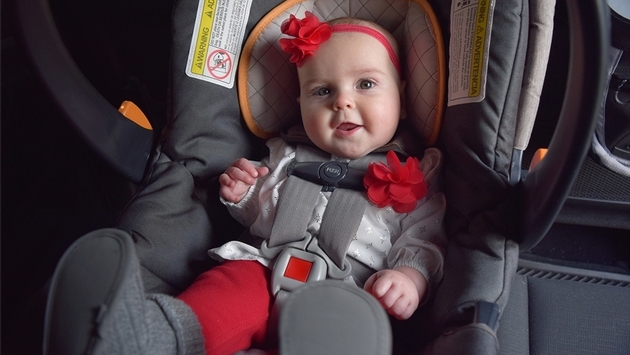 The American Academy of Pediatrics recommends that children remain in rear-facing car seats until age two, or until they exceed the height or weight limit for the seat. Take off coats and scarves and other bulky clothing before securing your child in their seat. This allows the harness to fit properly and securely. The safest bet, if you are flying and then renting a car, is to bring your own car seat. Rented car seats are an unknown, and travelers don’t know the history of the seat they are renting — like whether or not it was involved in an accident. Most airlines allow parents to bring a car seat for their child for free.